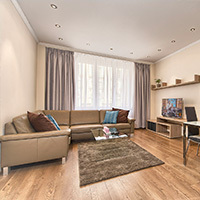 My family's experience with Prague-City Apartments was extremely positive. I was travelling with my wife and 2 teenage girls, so the clean and spacious 2 bedroom apartment was ideal. In addition, the location (located 2 blocks from the Vltava river) was extremely convenient. However, I was probably most impressed with the level of service. I have traveled extensively and rarely is the level of service as good as what we experienced here. Klara was always attentive to our concerns and addressed questions and requests promptly and kindly via email and text. The office staff was similarly helpful. Even the driver, George, who transported us to and from the airport could not have been more pleasant. The only negative comment I makeis that we were unfortunately in an apartment without air conditioning. This should not have been an issue since the weather was not particularly hot and Klara promptly sent over an array of fans. However, with the windows open, the sounds of late night revelry did echo in the apartment making sleeping somewhat difficult. For light sleepers, I recommend confirming an apartment with air conditioning. I would like to conclude by saying, however, that even with the loud street noises I would choose PragueCityApartments again. The positives of the experience far outweighed the negatives. We had a wonderful time in this well equipped apartment! This apartments was so great! Me and my friends had a really good time in Prague, the apartment was so beautiful with modern equipment and comfortable beds. There was everything you need for your stay. Staff was friendly and very helpful. It is very close to all major sights and public transport. Thank you so much for a nice experience, we're definitely coming back! We decided to stay at apartment KONVIKT even though it is new and there are only few reviews on it. We can now tell it was a great decision. We stayed at the apartment with our 6 m.o. baby and received the necessary equipment with no extra charge. The apartment is very spacious, clean and well furnished. It is located in a small and quiet street, but very close to Karl bridge and old town square. The service was great, starting from the initial inquiries until we left the apartment. The price was definitely worth it. We recommend it wholeheartedly!